Do you wake up in the morning with money issues on your mind? Do you spend money to lift depression or keep up social appearances? When it is increasingly difficult to stretch a dollar, discover God's principles of money management found in Scripture. 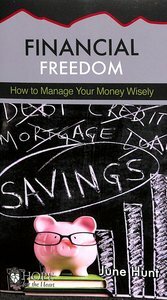 June Hunt's minibook on Financial Freedom gives Bible-based and practical advise to manager your money wisely so you can experience the freedom found in contentment.